They are out of new ideas so they try to pass this one off again. Saturday, October 17, 2009 LONDON — Global warming will leave the Arctic Ocean ice-free during the summer within 20 years, raising sea levels and harming wildlife such as seals and polar bears, a leading British polar scientist said on Thursday. Wadhams, one of the world’s leading experts on sea ice cover in the North Pole region, compared ice thickness measurements taken by a Royal Navy submarine in 2007 with evidence gathered by the British explorer Pen Hadow earlier this year. Hadow and his team on the Catlin Arctic Survey drilled 1,500 holes to gather evidence during a 280 mile walk across the Arctic. They found the average thickness of ice-floes was 1.8 metres, a depth considered too thin to survive the summer’s ice melt. Sometimes referred to as the Earth’s air-conditioner, the Arctic Sea plays a vital role in the world’s climate. As Arctic ice melts in summer, it exposes the darker-coloured ocean water, which absorbs sunlight instead of reflecting it, accelerating the effect of global warming. Dr Martin Sommerkorn, from the environmental charity WWF’s Arctic programme, which worked on the survey, said the predicted loss of ice could have wide-reaching affects around the world. “The Arctic Sea ice holds a central position in our Earth’s climate system. Take it out of the equation and we are left with a dramatically warmer world,” he said. Britain’s Energy and Climate Change Secretary Ed Miliband said the research “sets out the stark realities of climate change”. That dog won’t hunt. It was debunked in May of this year and I blogged about it HERE. The Catlin Arctic Survey, actually three unprepared warmists, called off their trip and had to be rescued from the cold and ice. Ice that was Twice As Thick as what they expected! The Global Warming Cult has nothing new to say so they will push old lies to get their way…and our money. The Global Warming Cult will be real disappointed in the way mother nature is conspiring against them to expose their scam. Arctic ice is thicker than expected, ski season in the southern hemisphere is starting Five Weeks Early, the “Catlin Trio” still can’t reach the North Pole and a three man expedition to reach Greenland in a “Carbon Free” boat had to be rescued……….by an Oil Tanker! !UPDATE! It appears the “Catlin Trio” are giving up. Check it out at Watt’s Up With That? The Viscount Monckton of Brenchley, aka Lord Christopher Monckton, refutes some of Al Gore’s lies. 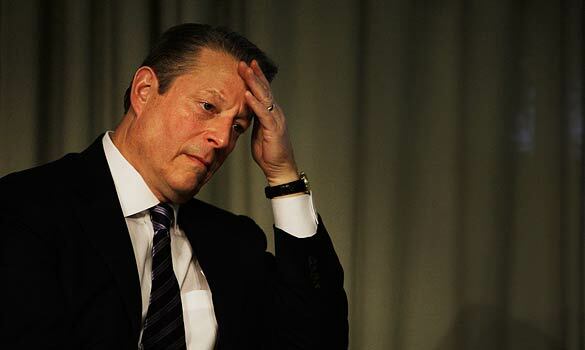 Gore: The Arctic is warming at an unprecedented rate. New research, which draws upon recently declassified data collected by U.S. nuclear submarines traveling under the Arctic ice cap for the last 50 years, has given us, for the first time, a three-dimensional view of the ice cap, and researchers at the Naval Postgraduate School have told us that the entire Arctic ice cap may totally disappear in summer in as little as five years if nothing is done to curb emissions of greenhouse gas pollution. For most of the last 3 million years, it has covered an area the size of the lower 48 states. Almost half of the ice has already melted during the last 20 years. The dark ocean, once uncovered, absorbs 90 percent of the solar heat that used to bounce off the highly reflective ice. As a direct consequence, some of the vast amounts of frozen carbon in the permafrost surrounding the Arctic Ocean are beginning to be released as methane as the frozen tundra thaws, threatening a doubling of global warming pollution in the atmosphere. Answer: For most of the last 3 million years, the Earth endured ice ages, with brief interglacial periods of 5000 years occurring roughly every 125,000 years. Naturally, therefore, Washington and much of the contiguous US was under miles of ice most of the time. We are in an unusually-prolonged interglacial period at present – 11,000 years. For most of that period – and notably during the Minoan, Roman, and medieval warm periods – it was warmer than today in the Arctic and worldwide. Indeed, in the 1930s and early 1940s it was up to 4 Fahrenheit degrees warmer than today in the Arctic. That is only a teaser. Be sure to read it all at Science & Public Policy Institute. Overall support for nuclear power seems to be growing, with 37% of respondents saying they’ve become more supportive in recent years. And 81% favor using more nuclear power, with only 19% flat-out opposed to nukes. That opposition is due to concerns over plant safety, nuclear waste, terrorism, and cost, in that order. We continue to live with a tsunami of lies regarding ANWR and the whole issue of “energy independence”, “dependence on foreign oil”, ad infinitum. The Obama administration so hates the oil and coal industries that, if they are mentioned, staff fall to the floor, spastically flailing about, and foaming at the mouth. Global warming alarmists want us to believe that the temperature of Earth would stay the same year after year, century after century, if not for “the human presence.” This is scientifically false. Huge climate changes have occurred before humans could possibly have played a role. More recently, global temperatures rose from 1900 to 1940 (1934 was the century’s warmest year), fell from 1940 to 1975, rose again from 1975 to 1998, and declined from 1998 to 2008. How does “the human presence” account for this variation? It can’t. Kinda makes you wonder just what their agenda is. So in other words, they don’t want to do some research and correct their records for fear it might not show the results they desire. As long as the error is in their favor, why go with the more accurate system. After all, it was only a mistake because someone else noticed it, otherwise, it’s fact.